Chordoma is a rare type of cancer that occurs in the bones of the skull base and spine. It is part of a group of malignant bone and soft tissue tumors called sarcomas. Chordomas account for about 3 percent of all bone tumors and about 20 percent of primary spinal tumors. They are the most common tumor of the sacrum and cervical spine. A chordoma tumor usually grows slowly, often without symptoms at first, and then might cause symptoms for years before doctors find it. Chordomas are complicated tumors to treat due to the involvement of critical structures such as the brainstem, spinal cord, and important nerves and arteries. They can also come back, or recur, after treatment — usually in the same place as the first tumor. This is called a local recurrence. In about 30 to 40 percent of patients, the tumor eventually spreads, or metastasizes, to other parts of the body. Who is affected by chordoma? Chordoma is diagnosed in just one in one million people per year. That means that about 300 patients are diagnosed with chordoma each year in the United States, and about 700 in all of Europe. 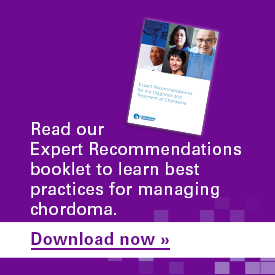 At any given time, fewer than one in 100,000 people are living with chordoma. Chordoma is diagnosed most often in people in their 50s and 60s, but it can occur at any age. Skull base chordomas occur more frequently in younger patients, while spinal chordomas are more common later in life. About twice as many men are diagnosed with chordoma as women. While chordoma can run in families, this is very rare (see “Are there risk factors for chordoma?” section below). About 30% of chordomas form in the skull base, 20% form in the bones of the mobile spine, and about 50% form in the sacrum. Chordomas can occur anywhere along the spine, from the head to the tailbone. About 50 percent of all chordomas form at the bottom of the spine, in bones called the sacrum. About 30 percent form within the center of the head in an area called the skull base – usually in a bone called the clivus. Skull base chordomas are sometimes called brain tumors because they grow inside the skull toward the brain; however, they do not actually develop from brain cells. The remaining 20 percent of chordomas form in the spine at the level of the neck, chest, or lower back. These areas are the cervical, thoracic, and lumbar spine, and all together they are called the mobile spine. Very rarely, chordomas can start in more than one place along the spine. Extremely rare cases of chordoma occurring in bones away from the spine have been reported in the ribs, legs, and feet. If chordomas spread to other parts of the body (metastasize), the most common places they spread to are the lungs, liver, bones, or lymph nodes. Metastasis usually only occurs when the primary tumor has advanced and is rarely reported at the time of initial diagnosis. You can watch this video from the National Cancer Institute to learn more about how cancer spreads. Chordoma tumors develop from cells of a tissue called the notochord, which is a structure in an embryo that helps in the development of the spine. The notochord disappears when the fetus is about 8 weeks old, but some notochord cells remain behind in the bones of the spine and skull base. Very rarely, these cells turn into cancer called chordoma. What causes notochord cells to become cancerous in some people is still not fully known, but researchers are working to learn the answer. Are there risk factors for chordoma? Is it hereditary? There are no known environmental, dietary, or lifestyle risk factors for chordoma. The vast majority of chordomas occur at random and not as a direct result of an inherited genetic trait; however, there are several genetic factors associated with chordoma. For example, more than 95 percent of individuals with chordoma have a single-letter variation, called a SNP (“snip”), in the DNA sequence of a gene called brachyury. This SNP causes an increase in the risk of developing chordoma, but does not by itself cause chordoma. In fact, a large fraction of the general population has this SNP, but individuals who have the SNP are still very unlikely to develop chordoma – the chances are less than two in a million. To learn more about the SNP and what it means for chordoma patients and family members, click here. There are a handful of known cases where multiple members of the same family are affected by chordoma. This indicates that in these very rare instances, a strong genetic predisposition for chordoma can be inherited. It is known that some of the families with familial chordoma have an extra copy of the brachyury gene, but currently, there is no available test for the presence of extra copies of the gene. The National Cancer Institute is currently conducting a genetics study to identify additional hereditary causes of chordoma. Chordomas have been reported at a higher incidence in children with the genetic disease Tuberous Sclerosis Complex (TSC). Changes in either of two genes involved in Tuberous Sclerosis Complex (TSC1 and TSC2) can cause a predisposition to developing chordoma. Are there different types of chordoma? 1. Conventional (or classic) chordoma is the most common form of chordoma. It is composed of a unique cell type that resembles notochordal cells and can have areas of chondroid appearance. 2. Poorly differentiated chordoma is a recently identified subtype. It can be more aggressive and faster growing than conventional chordoma, and is more common in pediatric and young adult patients, as well as in skull base and cervical patients. To help make a diagnosis of poorly differentiated chordoma, a pathologist can test a tumor sample for loss of expression of a protein called INI1. Nearly all poorly differentiated chordomas are INI1-negative, meaning they do not express the INI1 protein. 3. Dedifferentiated chordoma is more aggressive and generally grows faster than the other types of chordoma, and is more likely to metastasize than conventional chordoma. It can also have loss of the INI1 gene, but this is not common. This type of chordoma is rare, occurring in only about 5 percent of patients, and is more common in pediatric patients. 4. Chondroid chordoma is a term more commonly used in the past when it was difficult to distinguish conventional chordoma from chondrosarcoma. This is no longer a problem because brachyury is expressed in nearly all conventional chordomas, making them easier to distinguish from cartilaginous tumors like chondrosarcoma that do not express brachyury. There is no evidence that chordomas with a chondroid appearance behave differently than conventional types that do not have this appearance. The Chordoma Foundation Medical Advisory Board suggests that chordoma patients under 35 years of age, or whose tumors are growing unusually fast, have their tumors tested for loss of INI1, either through immunohistochemistry (IHC) or genomic testing. If tissue is not available for testing, the possibility of a biopsy to obtain tissue for this testing should be discussed with a doctor who has experience treating chordoma, carefully weighing the potential risks of biopsy. Interpretation of the testing should be done by a pathologist who has experience diagnosing chordoma. What is the prognosis for a patient after a chordoma diagnosis? It is important to remember that the prognosis for each person is unique, and depends on many different factors. These include the patient’s age, type of chordoma, size and location of the tumor, method of treatment, extent of resection, and other factors. Only your doctors can advise about your individual prognosis and risks, and it’s very important that this advice come from doctors who have experience treating chordoma. With appropriate treatment, many chordoma patients will live for a decade or more, and some can be cured. Our list of commonly used terms can help you understand the medical and scientific terms you may hear when discussing your diagnosis with your care team.